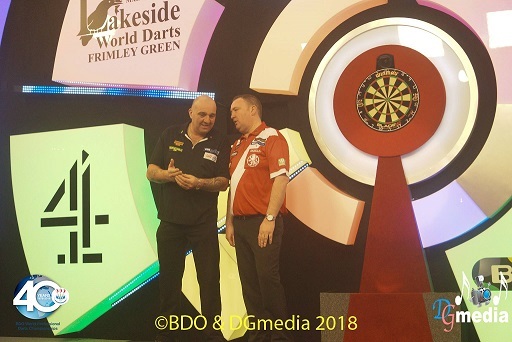 Defending men's champion Glen Durrant got through what he reckoned would be the hardest match of his career to reach the second round at the Lakeside. Ahead of his first-round match with Gary Robson, Durrant talked up his opponent's chances. He described the 50 year old from Cramlington as his "bogey man" and given that Durrant was sure to be nervous at the start of his defence and Robson didn't miss much in the preliminary round, there was the chance of an upset. As it turned out, Durrant was just too good. 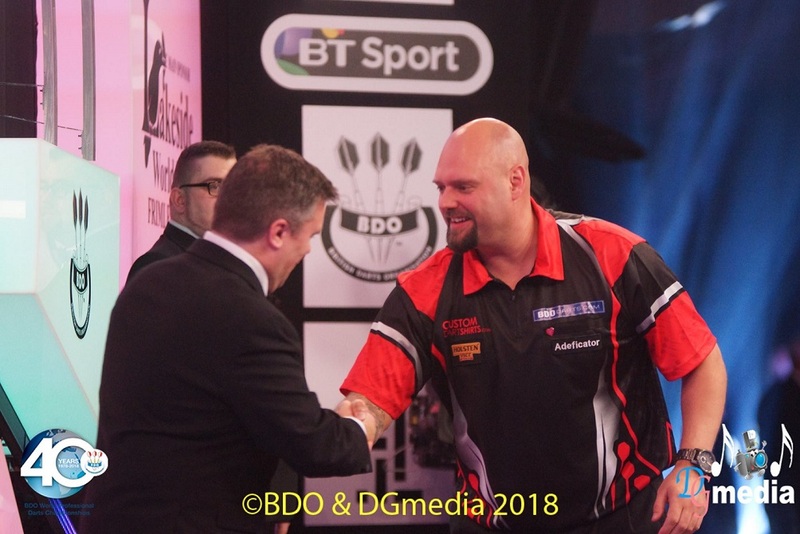 The 47 year old from Middlesbrough settled quickly, putting his seventh, eighth and ninth darts of the match in the treble 20, went on to win the opening six legs and finished with an average of 95.29. The opening set was soon wrapped up and Durrant broke Robson's throw in the opening leg of The second set after leaving tops after 10 darts. Durrant added the next in 13 darts to keep his average in three figures and he snatched the set from way back with a 78 check out after Robson fluffed chance after chance to hold. Bizarrely, the opening four legs of the third set all went against the throw. 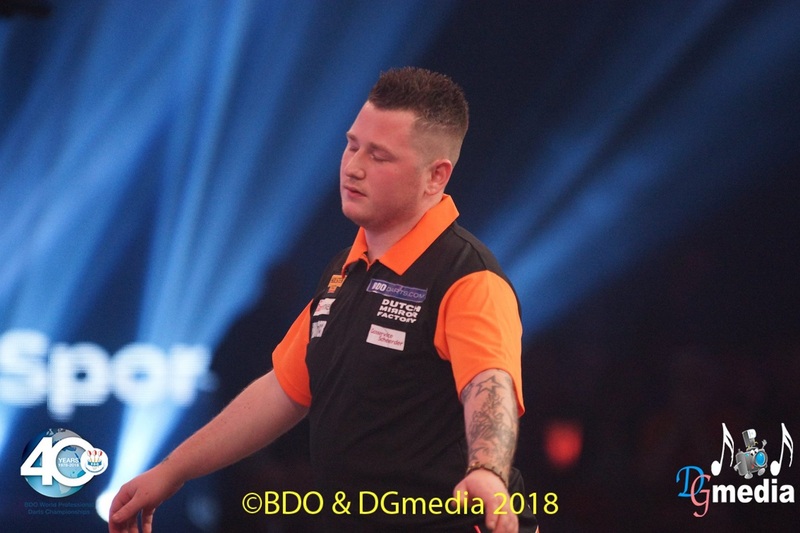 They traded ton-plus finishes in the first two legs, Robson breaking with a 116 finish, Durrant hitting back with 111, and the deciding leg went with the darts, the defending champion holding for the match. No 12 seed Dean Reynolds will meet Chris Harris after the Welshman came through a see-saw preliminary-round match against animated Turk Umit Uygunsozlu, winning the deciding fifth set 3-1. "I have a lot of confidence," said Harris afterwards. "I'm planning on winning it (the World Championship)." The women's first-round match between Fallon Sherrock and Corrine Hammond was in the balance at 1-1 in the third set. Sherrock then started pounding the treble 20 - and Hammond couldn't stay with her. 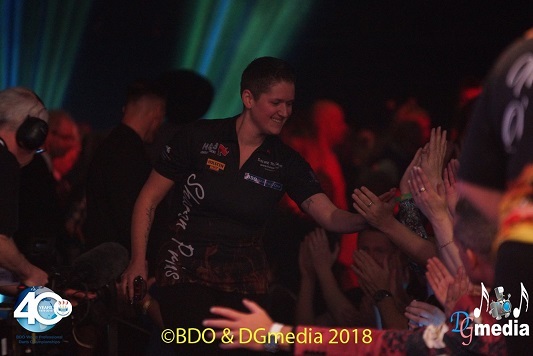 Sherrock got a crucial break after starting the third leg with scores of 140, 100 and 100 - and then held her throw for the match after Hammond missed two chances to save it. Sherrock meets Lisa Ashton in the quarter finals, a repeat of the 2015 final that Ashton won. 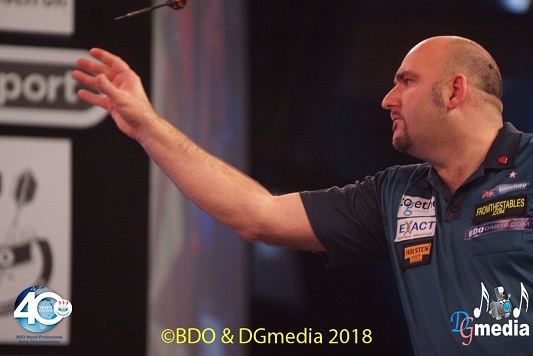 The best match of the afternoon was between two-time Lakeside champion Scott Waites and Ross Montgomery. Waites went through 3-1, but there was only ever a dart or two between them. The opening two sets both went to a deciding leg, Montgomery had a dart at tops to win both, missed and Waites mopped up for 2-0. The third set went Montgomery's way against the darts - he wrapped up the set with a 14 darter - but the Scotsman's fightback looked like ending there. Waites seized back control of the match with a break in the opening leg of the fourth set, then held - and blew six chances to win the match. Montgomery clawed his way back to level the set and had both the darts and the momentum going into the deciding leg. But he could only start with 40 and 60 and though Montgomery recovered to fling in 180 to stay in touch, Waites got to the finish first and took out 92 in two darts for the match. Swedish strongman Dennis Nilsson sparkled in his preliminary-round win over Jeffrey Sparidaans, a 3-0 victory that sets up a match against No 9 seed Jim Williams. Nilsson made a spectacular start, winning the opening leg with a 140 check out to set up a whitewash in the first set, and won a tighter second set with an ice-cool 77 check out in the deciding leg while Sparidaans sat on double 16. Nilsson wrapped up the third set 3-0, finishing the match with an average of 92.56. Smooth-throwing Dutch hope Sharon Prins takes on women's No 1 seed Deta Hedman in the last eight after a 2-0 win over left-hander Maria O'Brien. In both sets O'Brien won the first leg but couldn't keep up with Prins. Derk Telnekes came out on top against fellow Dutchman Chris Landman in their preliminary-round match. He was a 3-0 winner, all three sets going to a deciding fifth leg, to set up a first-round match against No 6 seed Geert de Vos. Welsh veteran Wayne Warren went close to Lakeside history during his upset first-round win over Dutch favourite Wesley Harms. Warren started the fourth leg of the first set with 180 . . . then another. That put the 55 year old on course for the first nine-darter at the Lakeside since Paul Lim way back in 1990. Warren put his seventh dart in treble 20, then aimed at treble 15 to leave double 18. But he dragged his eighth dart wide of treble 15. Warren's frustration was obvious, but he held himself together to win the leg against the throw and then the set. 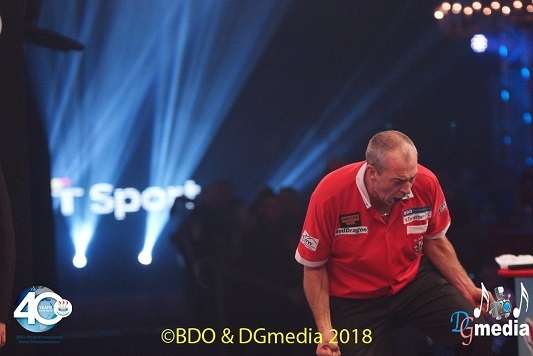 Harms upped a gear in the second Set, winning it without reply against the darts, and then after they swapped breaks in the third set, the Dutchman had the advantage in the deciding fifth leg. He missed three for the set - and Warren pinched it with a nerveless 101 check out on treble 20, nine, double 16. 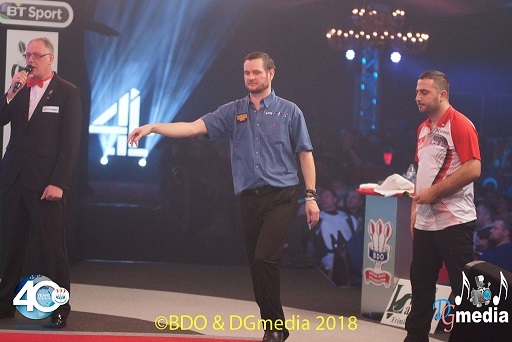 Warren opened the fourth set with a 12 darter, Harms won the next with a 101 finish - but the Dutchman didn't get another shot at a double as Warren outplayed him in the next two legs to claim a famous win, his first at the Lakeside after first-round exits in both 2005 and 2013.